Southpaw Kusal Janith Perera is eager to fill the lost tracks of the few months where he suffered that indignity of a wrong doping call by the ICC. In his first test match since the return he made a half century against England in a Test match and in his second ODI he scored a belligerent 135 to guide the Lankans to a huge 137 run win at the Village, Malahide, Dublin. Sri Lanka scored an imposing 377 for 8 in their allotted 50 overs while the home team replied with 241 all out. Being given task of scoring over 7.5 runs per over, the home team were never in the run. Among the Lankan bowlers, Suranga Lakmal was the main tormentor. He was responsible for 4 wickets at a cost of 38 runs in his allotted ten overs. Towards the end of the Ireland inning Andy McBrine came up with some histrionics and made 79, yet always only one team that could have won that game, after Ireland had lost four wickets for 71 runs by the 16th over. Earlier Ireland won the toss and invited the Lankans to take the first lease of the wicket and Danushka Gunatilleke opened batting with Kusal Perera. While Gunatilleke was circumspect at the initial stages, Perera who is naturally a more explosive customer was on the offensive right from the start. His first twenty five runs came in even deliveries with four fours – three off Boyd Rankin’s second over. Lankans were moving well to reach 49 for no loss at the end of the 10th over, and they reached the five run average once again when Gunatilleke hit the first six of the game off fast bowler Murtagh. The association then was nearing the 150 run mark when Gunatilleke miscalculated a sharp single and was run out for 63 when the score on 147. Gunatilleke scored 63, hit a six and six fours in 78 balls.Then Seekuge Prasanna who pushed to up the tempo turned the scoring rate topsy-turvy. In a limited overs game the score in the mid overs was rushing at the rate of 9.15 runs per over with especially tearing into the opposition. In the 33rd over the Lankans were 208 for 1 with Prasanna out on 43 in just 20 balls and Kusal Perera not out 93 in 101 balls of batting. Prasanna completed his half century in just 23 balls with sixes sixers and two fours — score 220 for 1 in 33.5 overs. Soon after it was Kusal Perera who became the Lankan centurion of this short series when he hit fast bowler Rankin for 4 and also reaching the 100 run stand between the two batsmen. 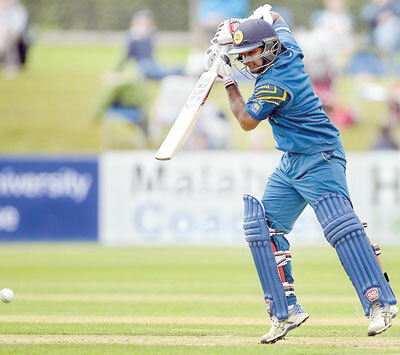 Perera faced 109 balls and hit eleven fours and two sixes. With almost ten overs left the Lankans crossed 300 run mark with Perera, but at the score of 308 Lankans lost their second wicket when Murtagh bowled Prasanna for 95 in just 46 balls hitting nine sixes and five fours. The two batsmen added 161 runs for the second wicket, in 15.2 overs. Then it was the turn of Perera to return to the pavilion becoming Murtagh’s second scalp of the over. He made a hectic 135 with sixteen fours and two sixers. Then with wicket of Dasun Shanaka for 1 the Lankan tempo fell and the score read 312 for 4 in 43 overs.